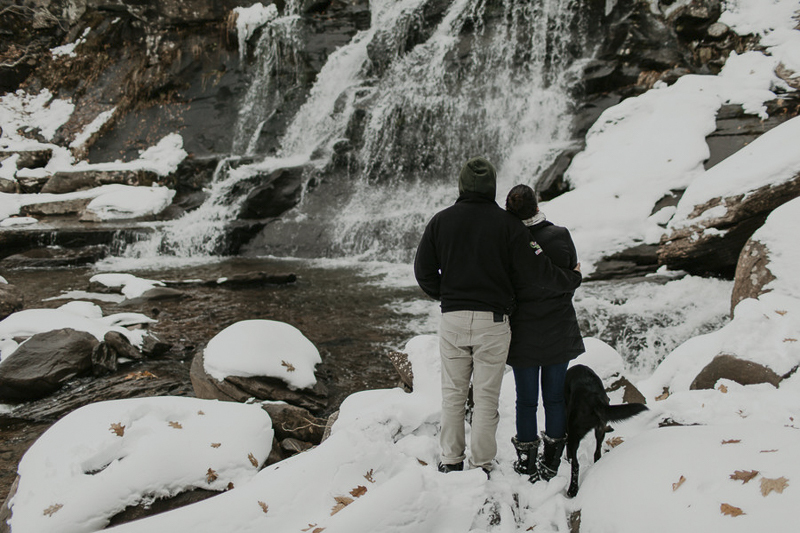 Although many couples book engagement sessions during warm weather, there’s something magical about a snowy session. 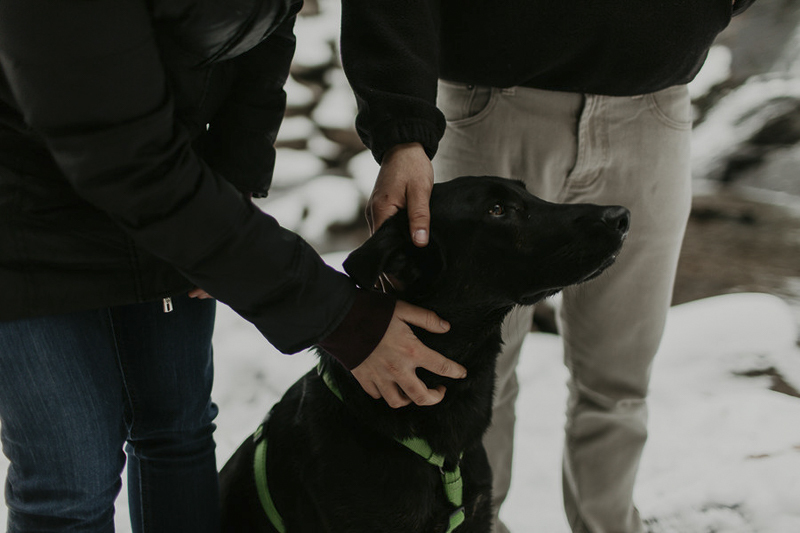 Brea from Belle La Vie Images photographed this dog-friendly engagement session with Jax the Shepherd-Labrador mix and his family. 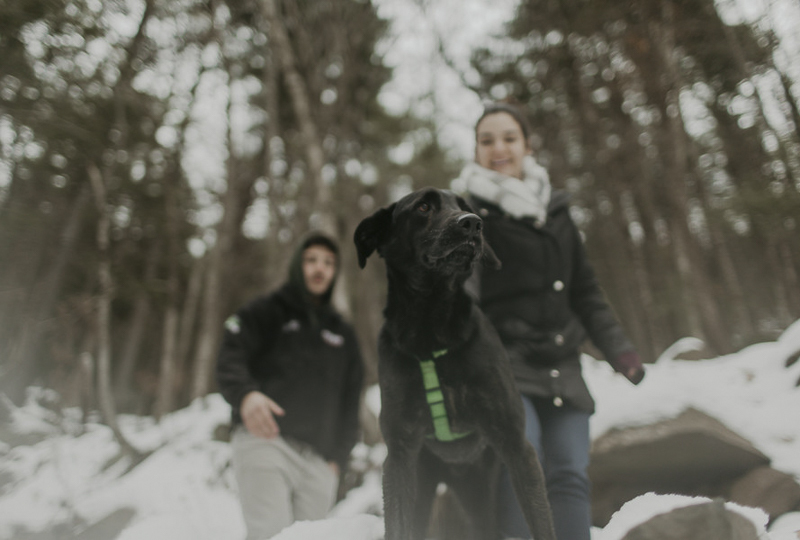 From Nicole: “My fiancée had been begging to get a dog for a few years now, and I wasn’t sure about the responsibility since we both work full time. But my job location had changed, and my schedule became more lax, so when my fiancée’s birthday came along, I thought it would be the perfect time to look into adopting. (I only considered adopting a dog because a few weeks prior my sister and I had found two very ill dogs running around the woods. After seeing them I wouldn’t consider anything else). I looked into the two we had found, but they were going to be in treatment for a while. So I went to a few different local shelters to see what options they had, so I could just bring him to a shelter and say “Surprise! You get to pick whatever you want!’ But Jax just about fell into our lap right before his birthday. I had called his parents to let them know the plan. A friend of theirs had flown their niece’s dog in from Arizona (we live in New York) since she could no longer care for him and was looking for a forever home for him. The friend only lived a few streets over from me, so I went to meet him. And when I did, I knew Jax was our dog — a gut feeling. A few days later on my fiancée Sergio’s birthday I ‘ran out for coffee’ and brought Jax home with me. Sergio couldn’t speak for almost a half hour because of his disbelief and excitement. Follow Brea Warren on Instagram. 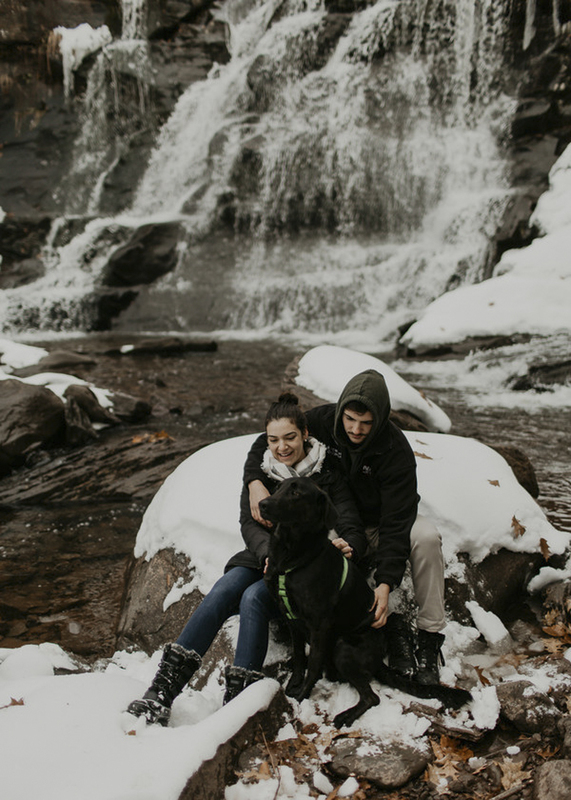 About Belle La Vie Images: Based in Hudson Valley, New York, Brea specializes in portraits and wedding photography as well as The Friendship Project. Beautiful pictures, and Jax is a very lucky boy! Jax is so handsome! 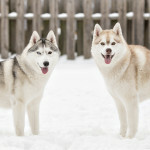 I love the winter photos. What a beautiful photo session! 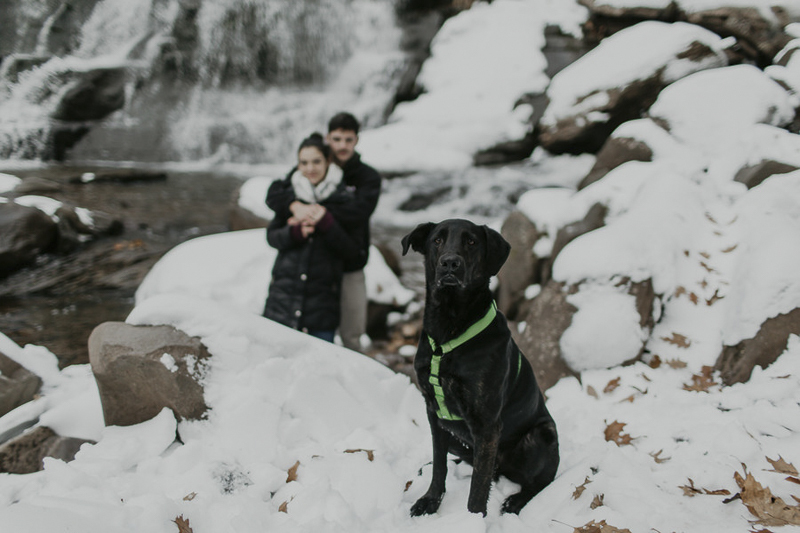 I love how the family braved the cold for a beautiful backdrop, and that Jax is the star of the shoot. Such a happy family. Aww I love the story of how she brought Jax home as a birthday surprise and made her man speechless. Clearly the three of them have a great connection- happy tails! This photographer is inspiring! How rad is this? 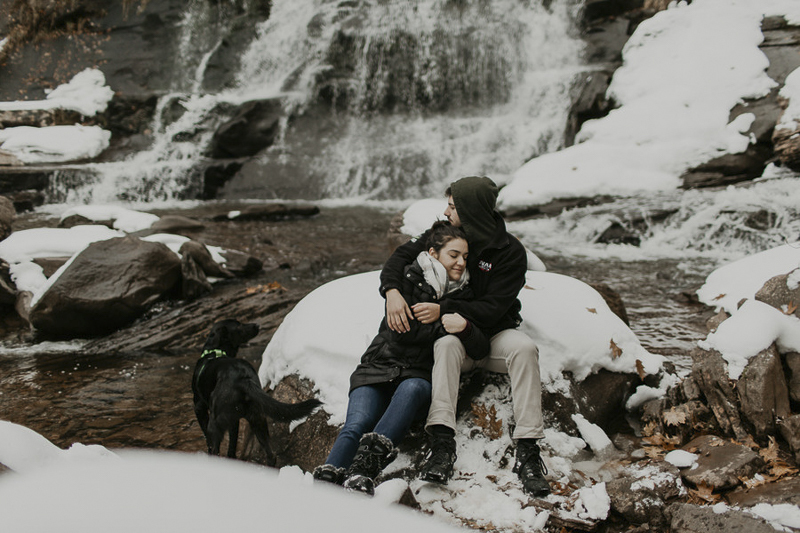 Engagement pictures in the snow with a chance to snuggle and show everyone in the family some love. The whole thing is totally magical. These are some beautiful photos but they sure made me cold! This southern girl likes her warm weather. Beautiful dog! Jax certainly has stolen all the shots! He is so handsome and I am so happy he found a new home with lots of love from them. I loved the photographs as always and he looks so proud in some of them.